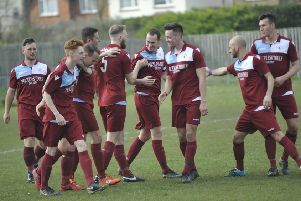 Hollington United Football Club saw its title hopes all but vanish with a home defeat against table-topping opposition yesterday (Saturday). The Lions’ 13-match unbeaten run in all competitions came to an end with a 3-0 loss to a good and experienced Cuckfield Rangers side in the Mid Sussex League Premier Division. Third-placed Hollington are now eight points behind Cuckfield with a game in hand and three adrift of second-placed Balcombe having played two less matches. Hollington only found out the previous Thursday evening that Sean Ray would be suspended after a sending-off for his under-18 side and with Andy Corrigan unavailable, they had a completely new back three playing together for the first time. In front of another great crowd at Gibbons Field, the hosts, nonetheless, started well and were on the front foot from the first whistle, making Cuckfield defend deep. Cuckfield, however, took the lead against the run of play with the game’s first real chance. The Cuckfield goalkeeper appeared to handle the ball outside his area and with the Lions protesting, his long kick fell to Phil Gault, who did what he has all his career and finished with ease. Within two minutes, Hollington were awarded a penalty when Danny Andrews was pulled down in the box. The usually reliable Glenn Woodhurst put the spot-kick wide and the score remained 1-0 at half time. With only a win good enough, the Lions knew they had to take the game to Cuckfield a lot more. That’s exactly what they did and Alan Foster almost equalised after being put through by Dan Hull. Hollington tried everything they had, but the visitors defended superbly and made life very difficult for the Lions. Cuckfield virtually killed the game off when they went 2-0 up and added a third not long afterwards, which made the scoreline a little flattering, but it was always likely to happen with Hollington chasing the game. Cuckfield were worthy winners and will no doubt go on to win the league. Hollington’s man of the match, sponsored by JD Mills, was Foster. As well as two cup finals, the Lions have five league games left to ensure they finish runners-up in their first Mid Sussex League season.